Fattoria di Arsicci, your home in Italy. 7 bedrooms, 6 bathrooms. Nice extra 2/3 sleeps bedroom on request. The ancient farm owners house is located in a small Appennino village, named Arsicci, which is 850 meters above sea level. The house has a front garden at ground floor and, at lower floor, a second garden giving access to the private wooded park with swimming pool. Arsicci is located close to river Tevere springs. There are many marked panoramic paths of different difficulty level in the mountains surrounding the village. The GEA path, which follows the Appennini ridge, passes on the nearby crest. Arsicci is located close to the towns of Borgo Sansepolcro (the renaissance painter, Piero della Francesca, town), Monterchi and Anghiari. The location. : Many of the most important art towns in central Italy can be visited in one day trip. On the Tirrenian side there are Assisi, Cortona, Gubbio, Perugia, Todi, Arezzo, Firenze and Siena; on the Adriatic Side Urbino, Ravenna, San Marino, Rimini the citadels of San Leo and Sassocorvaro. There are also a multitude of fascinating castles, shrines and hermitages such as La Verna and Camaldoli, sites of great spirituality in the early Middle Ages and Italian Renaissance. Restaurants in the area are superb, many of them are economically priced. Our names are Anna and Paolo. The house was purchased by Paolo Family in 1933. We own the old Paolo family farmhouse since 1999. We have been travelling all over the world for working and knowledge reasons; while travelling we have collected interesting things which have been used to complete the nice traditional furniture of our home. When we are in Arsicci we like walking and trekking on the surrounding beautiful and gentle mountains. Paolo loves Arsicci since he was born as well as his daughter Serena and his granddaughter Gemma. Anna and Paolo have always done what was necessary to keep this wonderful small tuscan village alive and in the best possible conditions. We live in Milano and when we are not in our property Giuseppina, a kind lady living in Arsicci, takes good care of the house and the park. Silence, wonderfull nature and landscapes very softly touched by human activities since thousand years. Very easy to reach art towns, art masterpieces, monastries and hermitages. Very, very large house where large groups can easily leave together but with private corners for everybody. The main entrance of the farm owner house is through the ground garden and gives access to the living and dining room with a stone fireplace, to a wardrobe with laundry-shower room and to the old fashioned kitchen and breakfast room with fireplace. A secondary entrance is through the four car garage and the wardrobe. A staircase leads to the lower floor in the playing and T.V. room with a stone fireplace, to the billiards and bar room, the children playing room to the reading room and toilets: all rooms communicate with the lower garden and the wooded park wi. From the ground floor entrance and the living room, two staircases lead to the upper floor where four king size bedrooms and one double bed room are located, each one with its private bathroom or shower room. At the upper floor are also located a three bed room and a studio with single bed. The rooms are bright and sunny and decorated with furniture of the 19th and early 20th century. The house has a central heating system. This is the 4th year we have been to stay at this property. It is absolutely stunning, very comfortable, large grounds, great pool and games and very relaxing. Perfect for our group reunion. Paolo is very helpful and welcoming and Guissepina is the best cook i have ever come across. Can't recommend it highly enough. Thank you for your kindness and your review. I hope to see you again in Arsicci. Thank you David for your review and hope to see you again bere. We have been many places all over Italy, but your house in Arsicci is beyond any doubt the loveliest place we have ever stayed. The beautiful old house filled with interesting things to look at, each bedroom with its own atmosphere and personality, the chilled basement filled with entertainment like the pool table for the warm evenings and an amazing kitchen to cook big family dinners in. And the surrounding garden - or rather, park - was such a luxury during the day with plenty of shade, and in the nights almost turning into a fairytale garden filled with fireflies! Thank you very much for your review. I am really happy you enjoyed your stay in my house and I hope to see you again in the next future. A beautiful and comfortable home in which nothing was missing! Surrounded by a forest and a wonderful natural environment. Great attention and very close people which is always ready to assist you. Definitely a home that is ideal for enjoyment and relaxation. Located in the sleepy mountain village of Arsicci, this converted farmhouse is perfect for a large family gathering. With panoramic views across the surrounding mountain landscape dotted with farms and hamlets, the silence is interrupted only by the distant clang of cows bells, and the atmosphere is very "Sound of Music". The house is comfortable, practical, and full of character. It's well equipped and has more or less everything you could need from pool towels to barbecue, although a microwave might be a useful addition. The pool and large gardens are very well maintained, and there are plenty of places to sit and read, or just kick back, do nothing, and take in the scenery. There are one or two small villages nearby, and the closest supermarket is in Pieve Santo Stefano, a small town about 20 minutes drive away. If you want to do some exploring, Paolo, our host, gave us some very useful pointers on places of interest, and what to see in the locality. Sansepolcro, a 35 minute drive away, is the nearest large town. A stroll around it's old quarter is a relaxing way to spend an afternoon. You would need to set aside a full day for trips further afield such as Florence or Siena. One of the highlights of our two week stay was the meals prepared by Giuseppena, a local lady who looks after the house. Before your eyes, she will conjure up some wonderful local dishes for dinner - a great option if you want to take a break from cooking. A beautiful setting and an ideal house for a relaxing family holiday. Immerso in boschi di querce, faggi e carpini, con qualche pino a sud, nel parco, il casale di Arsicci meravigliosamente ristrutturato nel rispetto della tradizione locale, è un'oasi di pace e di tranquillità che induce al riposo e alla meditazione; rimembranza e quasi riproduzione degli eremi francescani che si possono visitare nei dintorni, magari raggiungendoli a piedi con lunghe ma deliziose passeggiate nel verde. Crocevia di quattro regioni (Toscana, Romagna, Marche e Umbria), tra la Val Marecchia e la Val Tiberina, da qui si possono raggiungere in (relativamente) pochi minuti di automobile luoghi d'arte e di cultura unici al mondo. E non parlo (solo) di San Marino, Urbino, Arezzo, Perugia, Assisi, Gubbio, e altri notissimi luoghi compresi in tutti gli itinerari turistici, ma piuttosto di luoghi spesso dimenticati come San Sepolcro, Anghiari, Monterchi e Citerna o, più a sud. Spello, Montefalco e Bevagna. Qui, in un ambiente che del '3-'400 ha mantenuto fascino e bellezza, si possono incontrare il grande Piero della Francesca, Iacopo della Quercia, Tino di Camaino, affreschi di Benozzo Gozzoli e del Perugino, una Madonna con bambino (terracotta policroma) di Donatello trentenne, la "Deposizione" di Rosso Fiorentino, e molte altre testimonianze del genio italico. Alimento culturale per lo spirito e per la mente, quindi, di vera eccellenza. E il ritorno a "casa Arsicci" sarà reso ancor più piacevole dall'accoglienza principesca che vi riserveranno la casa con le sue stanze ampie e luminose (tutte con bagno privato), il salotto e la cucina ricchi di antiche risonanze, il parco e la piscina, insieme alla dolce cordialità di Paolo e Anna. E che dire della cucina di Giuseppina (disponibile su richiesta - fortemente consigliata - a preparare pranzi e cene)? "Alimento culturale per il corpo". Non trovo altra definizione. Ora, provate a tracciare una linea ideale tra Bolzano a Napoli: al centro troverete Arsicci! Vero "umbilicus Italiae", qui lingua, arte, natura e perché no? enogastronomia si incontrano in un equilibrio magistrale, che l'accoglienza di Paolo e Anna e la cucina di Giuseppina interpretano perfettamente e felicemente. 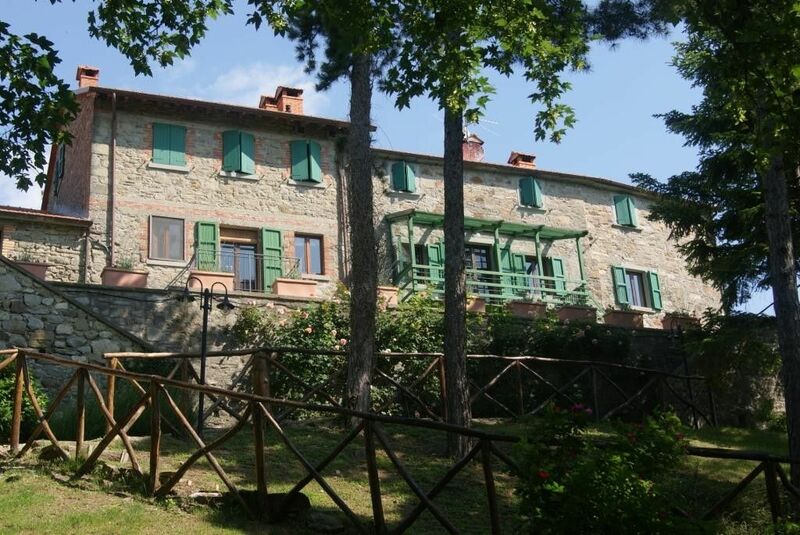 Arsicci is located close to river Tevere springs. There are many marked panoramic paths of different difficulty level in the mountains surrounding the village. The GEA path, which follows the Appennini ridge, passes on the nearby crest. Arsicci is located close to the towns of Borgo Sansepolcro (the renaissance painter, Piero della Francesca, town), Monterchi and Anghiari. Many of the most important art towns in central Italy can be visited in one day trip. On the Tirrenian side there are Assisi, Cortona, Gubbio, Perugia, Todi, Arezzo, Firenze and Siena; on the Adriatic Side Urbino, Ravenna, San Marino, Rimini the citadels of San Leo and Sassocorvaro. There are also a multitude of fascinating castles, shrines and hermitages such as La Verna and Camaldoli, sites of great spirituality in the early Middle Ages and Italian Renaissance. Restaurants in the area are superb, many of them are economically priced. Rates includes for saturday cleaning, weekly change of linen and of towels, including swimming pool towels in summer time. An additional nice bedroom 2/3 sleeps with shower room is available on request at an extra rate of 200 Euros per week Winter prices do not include for house heating, the cost is € 150 per day. Different agreements in intermediate seasons Price do not include for electric energy supply (0,40 €/kwh). Christmas 4 days price includes for central heating.